No. You would never put your loved ones on the NHS. No cause for complaint so far; including keeping me alive. My little girl is in Alder Hey next month, where Alfie Evans was the centre of such a furore recently. I'd carry her there on my back, barefoot, the place is wonderful. Edit: in actual fact, I'll drive her there in my Range Rover but you get the point. Edit: it's 25 miles, and my knees aren't what they were pre-Army and pre-parachuting on to concrete by mistake. Plus she's really grown the last year or two. It was a figure of speech. Of course it is. You are attacking me, the person, rather than countering the argument. It is quintessentially ad hominem. It isn't one proposal (it is actually 2, now since he just changed and re-released it). Sure, only the Sanders proposals call for banning most private insurance, but that is not what I am referring to. To say that a program that is funded by compulsory taxes and provided to people at no cost at the point of enrollment or use would not drastically shrink the individual market and all but eliminate the employer insurance market is unsupported by logic and economics. It would effectively (hint: that word doesn't mean by force of law, but by force of effect) demolish the vast majority of the private insurance market. But of course, I already explained this in my last post. And how about addressing the point that, once this is factored in, support for Medicare for all falls to 37%? So, you won't do so. OK.
And I know you won't be able to support the argument that altering the funding mechanism to a Medicare for all program would actually lead to the US system costing half as much with better quality. I know you won't be able to because A) it can't be supported and B) every single time I ask someone to on LNF they can't and the thread usually dies. So I expect much the same here. Did I call you a name? Did I insult you personally? Not really. I attacked your mode of argument, your use of memes. Please don't harbor the conceit that you can get away with defective logic by using the ad hominem dodge. If a portion of the private health insurance market decreases because there is a better alternative, then that is market forces at work. People are not stupid, you know. And factoring in a false meme isn't very honest, is it? 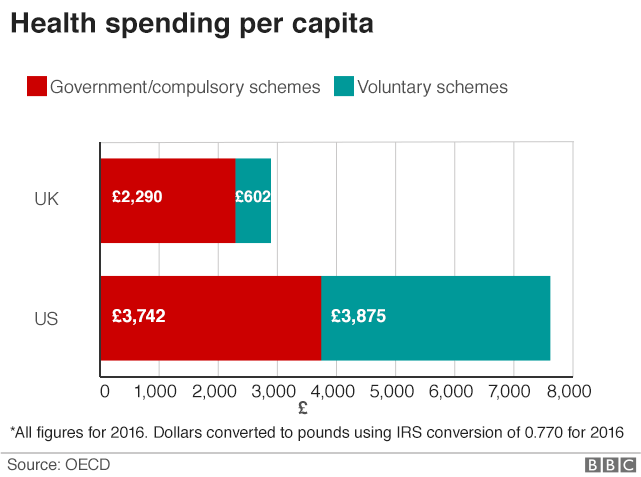 And yes, I posted convincing evidence that the NHS system covers a similar demographic (white middle class) at 1/2 the cost and twice as good outcomes as the American system. Again, I'm not going to repost it. It is now commonplace knowledge. The bottom line: I prefer the NHS to the American private system. It's a little more inconvenient in terms of appointment times, but due to the fact that it is free, has no paperwork, and the treatment on the day is super-fast, the NHS wins. That Rolls Royce is moving at a pretty decent clip. Americans think they have the best healthcare in the world. Take it from me, a fellow American: They don't. You didn't attack the idea of using memes. You didn't attack a mode of argument. You attacked me by saying "But I guess I'm not surprised to see you latch onto misleading memes like you have. It's predictable". This is not a counter to the idea of latching on to misleading memes or being predictable. This is an attempt to deride me -- rather than the things I have argued. LOL. When those people are forced to buy the government "alternative", no, that is not market forces and is also not an indication that this "alternative" is better. That is government manipulation and force. I honestly don't know which meme you are talking about. So, again, you will not support your claim? I see below you posted some vague numbers and rankings. Not sure if a ranking = twice as good. But perhaps you will get to that? You, again, will also not provide any support for the idea that changing the funding mechanism to "Medicare for all", whatever that may be, will lead to the same cost savings, right? How long before Useless starts another thread based on someone else's opinion? There has to be a Vox piece on the horizon. If you don't like my threads, don't read them.